Matfer Bourgeat is a French Industrial Group which is fully family owned. Over the past two centuries, the Group has become the industry leader in professional kitchens and laboratories around the world Matfer Bourgeat Inc., the American subsidiary for the Group, has now been serving America’s foodservice industry for 25 years. Polished Stainless Steel Paella Pan, Induction Ready, 14.12"
Stainless Steel Paella Pan, this pan has a wide and shallow cooking surface designed to saute meats and vegetables prior to adding rice. 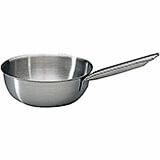 Pan with handles suitable for all hubs including induction. Sandwich bottom: stainless steel - aluminum - stainless steel provides uniform warming. Measurements: 14 1/8" Diam. 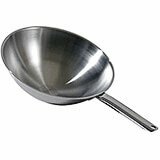 x 1 1/2" H.
Polished Stainless Steel Paella Pan, Induction Ready, 11"
Stainless Steel Paella Pan, this pan has a wide and shallow cooking surface designed to saute meats and vegetables prior to adding rice. 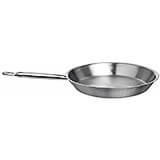 Pan with handles suitable for all hubs including induction. Sandwich bottom: stainless steel - aluminum - stainless steel provides uniform warming. Measurements: 11" Diam. 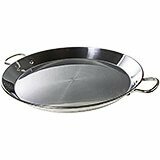 x 1 1/2" H.
Polished Stainless Steel Paella Pan, Induction Ready, 12.5"
Stainless Steel Paella Pan, this pan has a wide and shallow cooking surface designed to saute meats and vegetables prior to adding rice. 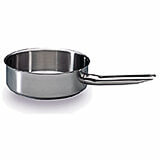 Pan with handles suitable for all hubs including induction. Sandwich bottom: stainless steel - aluminum - stainless steel provides uniform warming. Measurements: 12 1/2" Diam. x 1 1/2" H.
Stainless Steel Performance Frying Pan, 7.87"
Stainless Steel Performance Frying Pan, 9.5"
Stainless Steel Performance Frying Pan, 11"
Stainless Steel Tradition Frying Pan, 9.5"
Stainless Steel Tradition Frying Pan, 11"
Stainless Steel Tradition Frying Pan, 12.5"
Stainless Steel Tradition Frying Pan, 7.87"
Stainless Steel Excalibur Non-stick Frying Pan, 11"
Fry Pan "Excalibur" with non-stick interior and reinforced with stainless steel. Comfortable, stay-cool stainless steel handle. Suitable for all heat sources including induction. Capacity: 2 5/16 qt. Measurements: 11" Diam. x 1 3/4" H. Weight: 4 lb. 1 oz. 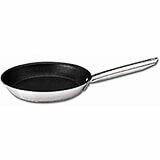 Stainless Steel Excalibur Non-stick Frying Pan, 7.87"
Fry Pan "Excalibur" with non-stick interior and reinforced with stainless steel. Comfortable, stay-cool stainless steel handle. Suitable for all heat sources including induction. Capacity: 7/8 qt. Measurements: 7 7/8" Diam. x 1 1/2" H. Weight: 1 lb. 13 oz. Stainless Steel Excalibur Non-stick Frying Pan, 9.5"
Fry Pan "Excalibur" with non-stick interior and reinforced with stainless steel. Comfortable, stay-cool stainless steel handle. 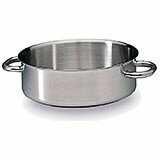 Suitable for all heat sources including induction. Capacity: 1 1/5 qt. Measurements: 9 1/2" Diam. x 1 1/2" H. Weight: 2 lb. 8 oz. Stainless Steel Excalibur Non-stick Frying Pan, 12.5"
Fry Pan "Excalibur" with non-stick interior and reinforced with stainless steel. Comfortable, stay-cool stainless steel handle. Suitable for all heat sources including induction. Capacity: 3 3/8 qt. Measurements: 12 1/2" Diam. x 2" H. Weight: 5 lb. 7 oz. 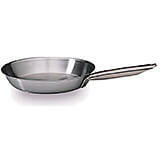 Stainless Steel, Excellence Saute Pan Without Lid, 11"
Stainless Steel Tradition Flared Saute Pan Without Lid, 11"
Stainless Steel, Excellence Saute Pan Without Lid, 7.87"
Stainless Steel, Excellence Saute Pan Without Lid, 9.5"
Stainless Steel, Excellence Braiser / Stew Pot Without Lid, 14.12"
Stainless Steel, Excellence Braiser / Stew Pot Without Lid, 11"
Stainless Steel, Excellence Braiser / Stew Pot Without Lid, 12.5"
Stainless Steel, Excellence Braiser / Stew Pot Without Lid, 15.75"
Stainless Steel Tradition Saucier Pan Without Lid, 7.87"